Greetings Earthling! I have come from outer space to protect your hand from that painfully hot pan in your oven. Use the advanced extraterrestrial, neoprene hand on our Greetings Earthling Oven Mitt to transmit hot pans safely to your counter. Now... Take me to your leader!! The other potholders in your kitchen are galaxies away from this great sci-fi hand that has landed on Earth. For the chef whose cooking is... out of this world! You are not an alien to the kitchen. Bake or cook like a true Vulcan chef, Roswell Area 51 cafeteria Martian or fun loving Astronaut. 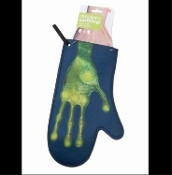 Outrageously hilarious funny novelty outer space character oven mitt makes dinner time an outer space adventure! Approx 13.4-inch Long x 8-inch Wide x 1/3-inch Thick.